•	Quality and Design. Ryan Steffens’ work attracts collectors for his choice of high-quality materials, his ability to highlight a rock’s organic design, and his ability to combine elements of light, stone, and water while still maintaining aesthetic and sculptural integrity. •	Distinctiveness. Compelling minimalism in Ryan’s design accents prominent patterns, colors, and natural formations that he then incorporates into a contemporary design meant to fit any green space or desert xeriscape. This approach is signature Ryan Steffens. •	Mine & Quarry Resources. 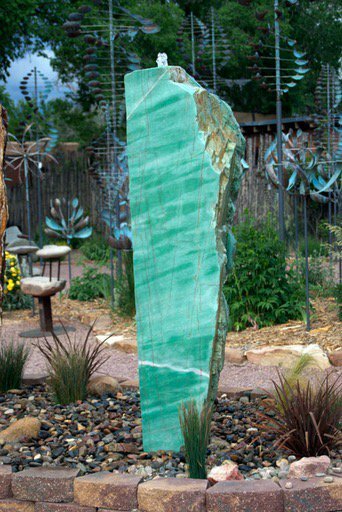 Developing relationships with owners of quarries and mines, such as the owner of the Madagascar labradorite mine, Steffens’ belief in taking the necessary time to travel to mines throughout the world allows him to hand-select the perfect (and often rare) stone for his sculptures. •	Global Collections. Collectors include landscape architects, zoos, botanical gardens, and designers, as well as private estates around the world in such places as France, England, Belgium, Norway, Aruba, Australia, Taiwan, and beyond. •	Investment & Commissions. Ryan Steffens’ artwork is often personally commissioned through Wiford Gallery of Santa Fe. The result is quintessential Steffens even as it incorporates the vision of the collector or landscape architect. Commissioned work provides additional lasting value, equity, and meaning for future generations. •	Collector Priority for Future Works. It is the policy of the Wiford Gallery that all new work by Ryan Steffens is presented to collectors first, then offered more broadly. For those beginning to collect now, while pricing is still affordable for a highly collected mid-career artist, this provides collectors right of first refusal for all future works. •	Stone Variety and Sculptural Features: Stones are chosen for geologic and unique features. These include, amongst others - travertine and sandstone from New Mexico; onyx, calcite and sandstone from Arizona and Utah; onyx and marble from Mexico, labradorite from Madagascar, and more. •	The Test of Time. Ryan Steffens’ meticulous scrutiny of raw materials, his search for the perfect stone for his sculptures and his intentionality in working unobtrusively with natural and organic forms provide collectors with sculptures that stand the test of time and are sought after, the world over.